Can anyone help me with step by step directions on how to make this bracelet? I wove my straight 4 wrap one into this shape with both ends end up on the same side as the button side of the clasp. Is there a video or step by step instructions anywhere on making this cool bracelet? 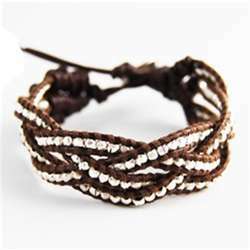 I only learned to make a single row Chan Luu bracelets with bead. A video would really be preferable. I'm not sure how exactly they were lashed together to begin with though. You'll have to improvise that.